Microfiber vs. Polyester: Which Fabric Should Your Sheets Be Made Of? You just came off the phone, finishing a call that brought most frightful information: your mother-in-law is coming! The thing is, you call her monster-in-law and for good reason! She’s merciless, uncompromising and as rigid as telephone pole in a hurricane. Worse of all, nothing is ever too good for her dear baby boy! The food must taste like a Michelin-starred chef prepared it, rooms must be of a specific temperature and the sheets, oh those sheets, they must feel like an angel’s wings fell out of the sky and got turned into a bedsheet. Obviously, the woman has pretty high standards and you need to either raise your game or risk incurring her wrath (compared to your mother-in-law’s tirade, let’s just say the flood that Noah saved all those people and animals from was just a drizzle). First things first: you need to get on your in-law’s bright side by giving her a nice bedsheet to snuggle up in when she arrives and takes her afternoon nap. You only have two sheets left. Which will it be? Microfiber vs. polyester, which fabric would she be impressed with? The pressure is on! Good thing we’re here to help you make the best decision! Don’t want to read through our whole guide? You can use our table of content to jump to the part most relevant to you! What is Microfiber and Will It Work for Her? So What’s Better – Microfiber vs. Polyester? Like your in-law’s eyes and ears, microfiber is ubiquitous; from mops to furniture, sportswear to bedsheets. However, what exactly is microfiber? And what makes it so useful and versatile? The term microfiber points to a synthetic fiber that is extremely thin, slimmer than a strand of silk (measured to be a fifth of the diameter of a human hair). Microfiber can differ in elements depending on the fibers that were used to create them. The end result is a very flexible fabric that holds a plethora of advantages over natural woven materials. What is Microfiber Made From? The most usual kind of synthetic material that microfiber is made from is polyester. However, nylon and other kinds of polyamides can also be utilized depending on how it will be ultimately used. On the surface, it may not seem as eco-friendly as natural fabrics but you have to know that during production of polyester microfibers, no pesticides are used and the dyeing procedure does not at all need any water, which means less waste. In this regard, microfiber helps the environment a great deal compared to cotton that needs a huge amount of water for the dyeing process. Makers change and mix up different types, sizes and lengths of fibers to make use of particular elements of microfiber, depending on what they are making. As an example, if the manufacturers want a fabric to be water absorbent or super soft, they can use specific fibers to make that happen. What is Microfiber Used For? Microfiber boasts of a wide range of suitable properties that makes it valuable for a remarkable range of products. Microfiber is commonly used in cleaning products such as cloths and mops. With its ability to carry up to seven times its own weight in water makes it useful in soaking up spills. However, its most useful characteristic is how microfiber can pick up bacteria from grimy surfaces. During the manufacturing process, the fibers are split making them extremely effective at picking up dirt. In addition, microfibers can also draw and catch bacteria and viruses from a number of surfaces. Pathogens feed on organic material, so the synthetic element of microfiber cloths means they can catch and eliminate any bacteria that are lingering on the surface. This diminishes the risk of germs and illnesses being spread in any place that they are being used in. The tiny fibers also means that microfiber is non-abrasive, so it won’t destroy or harm any surfaces even when paired with cleaning solutions. Microfiber’s water-absorbing quality also makes it an ideal choice in athletic wear. It manages to wick moisture away from the skin, keeping you cool and dry in spite of the heated action. When it comes to beddings, the use of microfibers is a fairly new trend. If the price of high quality cotton sheets is beyond what you want to shell out, microfiber sheets are capable of providing an identical level of luxury for a fraction of the price. And because microfibers is manufactured, there is no expense associated with growing, harvesting, spinning, and weaving as it is with cotton so the markup is considerably less. Microfiber sheets are usually a little thinner but are just as strong if not stronger and more durable than cotton sheets. What are the Kinds of Microfiber? This indicates to the fibers and whether they are split during the production process. Split weave microfiber is made by the fibers being split in production. This raises the surface area, which results in more water being absorbed by the material. Thousands of tiny loops are established when the threads are split, which are ideal for picking up small dirt particles without being coarse. Flat weave microfiber is not made for cleaning or sportswear, as it has half the moisture absorbing proficiencies of split weave. If you are not sure whether a cloth is split or flat weave microfiber, you can simply run your hand over the surface of the product. If it is split, the fibers will cling to the skin. Now that you’re familiar with what microfiber is, let’s quickly (and we mean fast before your in-law arrives to a bare bed!) learn about polyester. If you’ve made up your mind about a purchase, find out what the best polyester sheets are by clicking here. Polyester is defined as “long-chain polymers chemically composed of at least 85% by weight of an ester and a dihydric alcohol and a terephthalic acid.” It basically means the linking of a number of esters within the fibers. The reaction of alcohol with carboxylic acid leads to the formation of esters. What are the Characteristics of Polyester? It was W.H.Carothers who discovered that alcohols and carboxyl acids could be mixed to generate fibers. Carothers was working for duPont at the time and when he discovered Nylon, polyester suddenly took a back seat. Today, the major contributor to the appeal of polyester is the discovery of microfibers. Microfibers give polyester the feel of silk and are quickly becoming the fabric of choice. Polyester is used in the manufacturing of different kinds of clothes and home furnishings such as bedsheets, pillows, furniture, carpets and even curtains. High tenacity and good durability makes polyester the choice of fabric for high stress outdoors use. Polyester is also a strong fiber that is hydrophobic in nature. It is thus perfect for clothing to be used in wet and damp conditions. The fabric is also coated with a water-resistant finish and further intensifies the hydrophobic nature. The most common use of polyester today is to make the plastic bottles that store our much beloved beverages. By creating hollow fibers, it is also possible to generate insulation into the polyester fiber. Air is trapped inside the fiber, which is then warmed by the heat of the body. This keeps the body warm in cold weather. Polyester is also wrinkle resistant and is used often in daily wear like pants, shirts, tops, skirts and suits. Used either by itself or as a blend, it is also stain resistant and hence very popular. If you’re keen on making a purchase now, click here to see what the best polyester sheets are! So, What’s Better – Microfiber vs. Polyester? Microfibers are mostly made from polyester. While not all polyester sheets are made with microfibers, not all microfiber sheets are made from polyester either. Sometimes they are made with polyamides or polyester and polyamide hybrids. That said, let’s move forward and see which is better: microfiber vs. polyester sheets? If you’re just looking for something that can last for quite some time, you really don’t have to look any further. Polyester is the answer. Bedsheets made out of polyester are reasonably water resistant, dirt resistant and they tend to retain color for a very long time. One minus that you should know is that when reacting to oil, polyester form stains that are just downright impossible to get out. So if you’re as clumsy as they come especially if you have any plans of bringing oil to your bedroom, better stay away from polyester. Polyester is water resistant, hence it doesn’t hold water and doesn’t become as heavy as cotton fabrics when wet. On the other side of the fence, microfiber sheets are like sponges and can hold up to seven times their weight of water. And they also give up water faster as well. This makes microfiber sheets easier to wash and it also dries faster too. So if you’re the type that washes their sheets on a consistent basis, you’re better off picking microfiber sheets. Pilling is the formation of small bobs on the fabric surface. Pilling is considered to be a major eyesore in the world of textiles. As time passes by, both microfiber and polyester sheets do tend to start pilling and it primarily depends on the fabric’s quality. If the sheets are produced with a high thread count (such as less than 400) and is made by a reputable manufacturer, then pilling should be minimal. Breathability refers to the ease with air can flow through the sheets. Polyester sheets trap the heat and keep the moisture inside while you’re using it. Safe to say, breathability is quite poor in polyester. This means if you perspire a lot or reside in a place where it is humid and hot, your sweat will not get off your skin quickly. Microfiber sheets are not the most breathable of fabrics and can can cause discomfort if you are a night sweater. Although they might be hot to use in during summer, microfiber sheets will come mighty handy during the frigid months as these will keep you warm and cozy without putting a strain on your heat bill. This is dead even as polyester and microfibers can be quickly mass produced thus resulting in lower production costs, which then leads to lower prices on shelves. 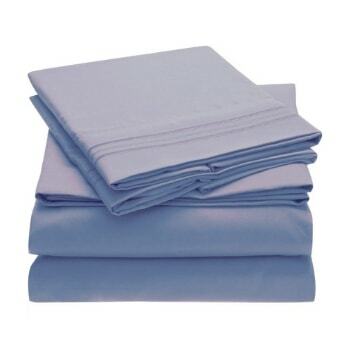 If you are ready to buy one, click here to see what our recommended microfiber sheets are! 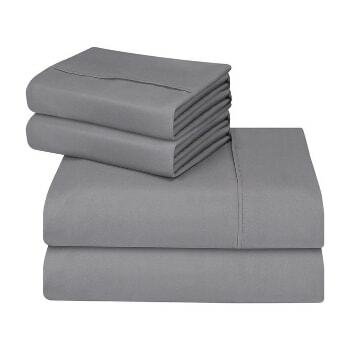 The AmazonBasics Microfiber Sheet Set makes it possible for you (or your mother-in-law!) to sleep on silky soft sheets without having to pony up a fortune. These polyester sheets are made with the thinnest fibers, which makes for luxurious feel to every inch of the sheets and pillowcases. The fitted sheet also boasts of an elastic that goes all the way around, which should fit snugly on your mattress. The great thing about microfiber is that it hardly wrinkles, even if you leave your sheets in the dryer for a few minutes after the bell rings. Plus, the color you choose should remain as vibrant even after many years of usage. You should note, though, about pilling, the thinness of these sheets, and the static they draw. Take the utmost care when washing your sheets, and they shouldn’t pill, but pilling seems to be inevitable. Also, these sheets are remarkably thin – lighter colors will show the logo of your mattress through them. And lint is going to stick to your sheets, but it should all come out in your dryer’s lint trap. If you’re the type that really has an issue about pilling, then the Utopia Bedding microfiber is perfect for you! This doesn’t seem to suffer from that particular issue. Numerous users have touted these sheets since they didn’t pill at all, even after several washes. These sheets are also incredibly soft. And they are a bit thin, which helps with keeping you cool at night. Because of the material, though, these sheets can also keep you cozy warm at night. The colors are saturated, and they shouldn’t fade over time. 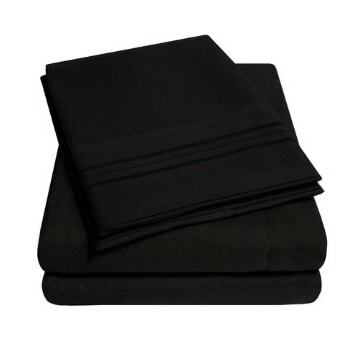 Like other microfiber sheets, these don’t wrinkle easily. Perhaps best of all, they’re ridiculously affordable. You’d love to have ridiculously soft cotton sheets but just don’t have the ridiculous resources for them? Fret not! 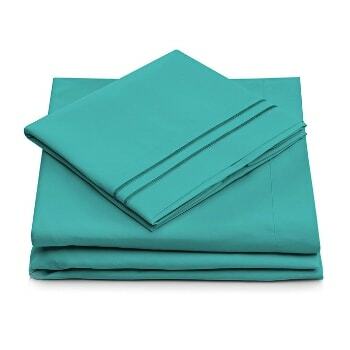 The Sweet Home Collection’s microfiber sheet set is an inexpensive alternative to cotton sheets with a 1500 thread count. Microfiber sheets don’t actually have a thread count, but 1500 sounds high which means that the sheets should be ridiculously soft. You will also love the colors, which are deeply dyed and numerous. Wrinkles aren’t a worry either. The Mellani Bed Sheet Set has nearly 50,000 reviews on Amazon, making it one of the most popular bedsheets around. If you’re after excellent quality at a low price, this is ideal for you! It’s also very versatile as you can get one to suit your needs with its availability in seven sizes and 39 fabulous colors. Each set includes one fitted sheet, one flat sheet and two pillow cases. This product is thin but durable and its colors last a long while. It’s also very soft and silky smooth to the touch. If that “cool” feeling is what you’re after, then check the TEKAMON Queen Bed 6 Piece Sheet Set out. They keep you cool while you sleep, they are uber soft and comfortable, capable of giving you that heavenly sleeping experience. These have been made with high-quality microfiber polyester that fluffs incredibly to give you a cozy feel and most relaxing sleep. The top is made of brushed microfiber fabric that gives superior comfort against your skin. If the quality of these sheets don’t wow you, then its affordable price range will. Wait until you run your hands over these super-soft sheets. Its secret lies in its ultra fine knit, which is equivalent to a 1,500 thread count, resulting in an elegant fabric that literally feels softer than silk. For added comfort, it’s even been double-brushed. In addition, the material is hypoallergenic and it won’t attract pollen or dust mites. It breathes even better than cotton, with a fabric that is lightweight but also very strong and durable. Lastly, you won’t have to worry about washing stains out of these sheets as its tight woven nature naturally repels stains and water. And in the event that you do wash them, they are easy to clean and dry faster as well. So, what’s better – microfiber vs. polyester? 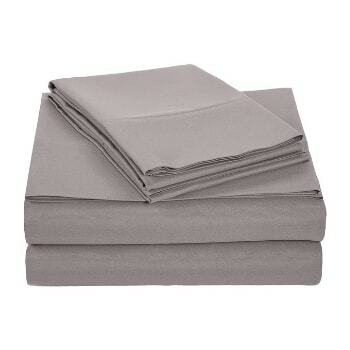 Polyester sheets have come a long way and I actually have tried some microfiber sheets that feel better than cotton. Microfiber sheets are more durable and usually a bit cheaper but there is not a big difference in price, so this might be a great choice if you want to prove to your mother-in-law how cost-efficient you are without compromising quality. But if your mother-in-law is sensitive and has allergies, polyester sheets are a great option! She’s on her way and the ball is on your court! Best of luck! Find Out What Sheet You Should Cozy Into: Fleece vs. Flannel? Cotton vs. Tencel: Which Fabric Should Your Sheet Be Made Of? What are the Bamboo Pillow Benefits That You Can Enjoy? What’s the Best Sleeping Position for Back Pain?